NEW!! CTUF AUTUMN – TUC 2017 NEWSLETTER: Rosa Crawford on Trade Deals & Employment Rights; Mike Hedges on Taylor Review; French Labour Law Row; Mary Turner Obituary by Peta Steel; Alys Cunningham on Holiday Pay Tribunal Win; Dave Prentis on ET Fees Win; Nissan Anti Union Fight. Download the Campaign For Trade Union Freedom Autumn 2016 Newsletter by clicking here. ‘No Deal: Why Unions Oppose TTIP & CETA’ – Irish Congress of Trade Unions Document. Click here to download. CTUF Spring 2016 newsletter: PCS Check off victory; Trade Union Act; TTIP, CETA; US unions, Uberization. NEW GENERATION OF TRADE AGREEMENTS – UPDATE: The Campaign For Trade Union Freedom – briefing & speakers is working on a new set of speakers notes on the New Generation of Trade Deals (TTIP, CETA, TiSA, TPP, ‘Fast Track’ etc) by Adrian Weir which include the post Brexit situation and other new trade agreements including the EU-Mexico Agreement. For the time being the pdf has been removed. CTUF Newsletter November 2015 click to download the latest edition. A Losing Proposition: The Failure of Canadian ISDS Policy at Home and Abroad. Canadian corporations abuse investment treaties, bully governments into environmental backtrack: Study. Thanks to Ben Davis. IUF DOCUMENT: Supressed NAFTA Report Shows Threat To Global Agriculture. Thanks to Peter Rossman at the IUF. NEW: 20 Years on From Nafta – Download pdf by clicking here. NEW: TTIP : European Disintegration, Unemployment and Instability by Jeronim Capaldo. Sent in by Les McDonald, JSUNNC Chair, Ford UK. NEW: Download an excellent article by Daniel Blackburn of the ILTUR on the ILO And The Right To Strike. NEW: The ILO And The Right To Strike. Downlaod NEW: ‘TPP in Focus Investment and Investor-State Dispute Settlement – The Need for Reform’. Sent to us by Ben Davis of the United Steelworkers in the USA, Ben comments: “This document was released by Democratic Rep. Sandy Levin proposed “reforms” to ISDS to make trade agreements more acceptable. This is the same strategy being pursued by (undoubtedly in co-ordination with) German MEP Bernd Lange – putting lipstick on the ISDS pig to make it acceptable”. It’s not – and it should be opposed. Position Paper of the German Trade Union Confederation (DGB) On the Free Trade Agreement between Canada and the EU (Comprehensive Economic and Trade Agreement, CETA). Download pdf here. CTUF WINTER 2014 – 2015 Newsletter: Articles by Leo Gerard, USW; Jude Kirton Darling, MEP, Tony Burke; IG Metall. Download the pdf here. The TTIP’s impact: bringing in the missing issue by Martin Myant, ETUI and Ronan O’Brien, independent researcher. Download information here. United Steelworkers in Canada Set Out Their Opposition To CETA (EU-Canada Free Trade Deal) Click here to read the full letter from Ken Neumann of the USW. Thanks to Mark Rowlinson of USW, Toronto. European Council concludes: EU & US should make all efforts to conclude #TTIP negotiations by end of 2015. Download document here. German DGB says suspend the negotiations on TTIP & CETA – Download a copy here. TTIP & the Implications For Labour – the first book so far on TTIP and implications for the Labour Movement includes appendix on CETA. 200 plus pages. Download a copy here. CTUF Newsletter CTUF Summer 2014 Download your copy. Articles on US alt unions fighting McDonald’s by Tony Burke; Adrian Weir on Respect At Work; Carolyn Jones looks at Countering Inequality plus: Bromley Council; Carr Review Collapse. CTUF NEWSLETTER: CTUF NEWS WINTER 2013 download your copy. The Story Of The Pentonville Five by Graham Stevenson Click Here. 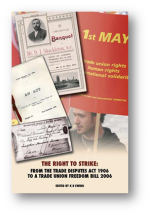 The Institute Of Employment Rights popular book the ‘Right To Strike’ sold out quickly when it was launched in 2007 and, with many people’s minds focused on the practicalities of a general strike, the IER have recently seen great demand for the publication once more. In response to this, they have re-published the Right to Strike in an electronic format and cut the original price by 66%. , the book tells the story of the Trade Disputes Act 1906, in celebration of its then centenary. That Act was one of the most important pieces of labour legislation ever passed by a British Parliament. It provided very simple legal protection for the right to strike for sixty-five years, and left a legacy which is found on the statute book to this day. The substance of today’s law however, is far removed and much weaker than the position established in 1906. For that reason, the Trade Union Freedom Bill is designed to soften some of the harder edges of the Thatcher bequest. The 15 authors contributing to this authoritative report – all involved in the Institute of Employment Rights unique network of academics, lawyers and trade unionists – examine the twists and turns in the judicial and statutory developments surrounding the right to strike over the last 100 years. It begins by reviewing the industrial and legal origins of the Trade Disputes Act before cataloguing how the vulnerable immunities introduced by the Act were systematically unravelled by a class conscious judiciary then periodically reconstructed by sympathetic politicians. The final chapters consider the savage deconstruction of trade union rights during the Conservative years of the 1980’s and 1990’s and assesses where we go from here. Our system of immunities is compared with the European tradition of fundamental rights as protected by national constitutions. And the book concludes by proposing the initial steps required from a Trade Union Freedom Act if UK laws are to meet the needs of working people in the 21st century. Buy the book by clicking on the graphic above! Kevin Halpin was a founder member of the Campaign For Trade Union Freedom’s predecessor the Liaison Committee For The Defence Of Trade Unions. 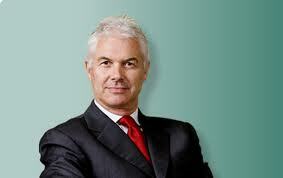 One of Britain’s leading communists, Kevin Halpin has been a fighter all his life. As a child in Preston, he fought the poverty that saw his grandmother die in the workhouse. After the death of his mother, seven-year-old Kevin fought an increasingly harsh father. At school, he fought the teachers who dished out six of the best for questioning religion, and in the streets, he was a champion scrapper. Later he fought the Nazi’s in the Mediterranean before going on to become one of the noted leaders of engineering and other workers in a lifetime of struggle for justice and a better world. Through it all his wry sense of humour has kept him cheerful while sustaining those around him. A love of cooking and a keen enthusiasm for invention has also marked the career of this remarkable man. His sharp observation of the world around him from early childhood onwards helps to make his account of a life lived to the full both readable and inspiring, with many a chuckle at the ironies of human nature. Kevin has divided his account of life through the 20th century and beyond into 15 chapters. They cover his early years in Preston; his wartime service in minesweepers; joining the Communist Party and the start of his main working life back in Britain, together with his growing Marxist education.There’s a detailed examination of the impact of the historic 20th Soviet Communist Party congress and its impact on political thinking in Britain. 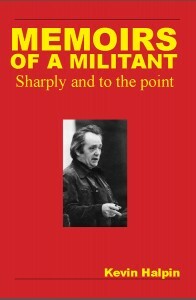 Accounts of political activity, historic strikes, blacklisting and the crises within the communist movement spring to life as Kevin weaves through them the pithy and humorous observations of a man who was there, saw it all and understood what was happening. Click on the book cover above for more details on where to buy Kevin’s biography. Recent rulings the European Court of Justice have seen workers’ fundamental rights lose out to business rights in the EU. The judgments in these cases have had a profound and far reaching effect for trade unionists across Europe. The Campaign For Trade Union Freedom believes the ECJ decisions are wrong and are supporting the ETUC and others fighting to redress the balance in Europe. A comprehensive overview of the ECJ cases and trade union rights has been compiled by United Campaign National Secretary John Hendy QC and Prof Keith Ewing. 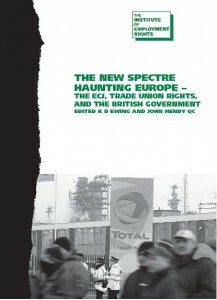 ‘The New Spectre Haunting Europe’ is available from the Institute of Employment Rights. The Trade Union Rights and Freedoms Bill was first brought before Parliament on the 2nd March 2007 and had its final reading on the 19th October 2007. To coincide with the reading of the Bill the United Campaign organised rallies and a national demonstration outside the House of Commons. Despite the Bill not passing, it remains a key document outlining the minimum acceptable rights of trade unions and continues to have the support of the TUC. Click here to read more about the Trade Union Freedom Bill. The Campaign For Trade Union Freedom will continue to fight for a Trade Union Freedom Bill. United Campaign Newsletter – click here to download electronic version.